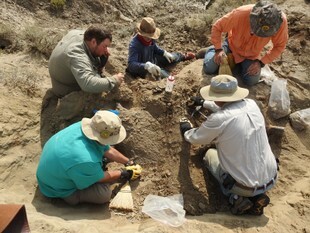 Please join our team, headed by none other than Forest Service Paleontologist Barbara Beasley, as we excavate two Triceratops dinosaurs from the Late Cretaceous badlands of the Little Missouri National Grassland, located near Marmarth, North Dakota! This two-week project will predominately be excavation with some possible pedestrian surveys, if time permits. The terrain is rolling hills and steep-sided buttes, formed from ancient deposits of volcanic ash, sandstone, clays, and organic layers composed of carbonized leaves and swamps. We will excavate, document, plaster, and remove the specimens. But TWO Triceratops? Wow! What better way to spend a summer?